Not only is this a very late review for a rather good album, but for all the lateness that gave leeway for a more detailed analysis, the main question remains: What genre do we put Dad Rocks! in? Folk? Too intricate for it. Baroque pop? Not enough chamber instruments, but we are getting there. Dad Rock? Well, maybe, but again, the songs’ structures are all but four chords and an uplifting chorus. So who gives an hibiscus flower what box should we put this lovely band in? 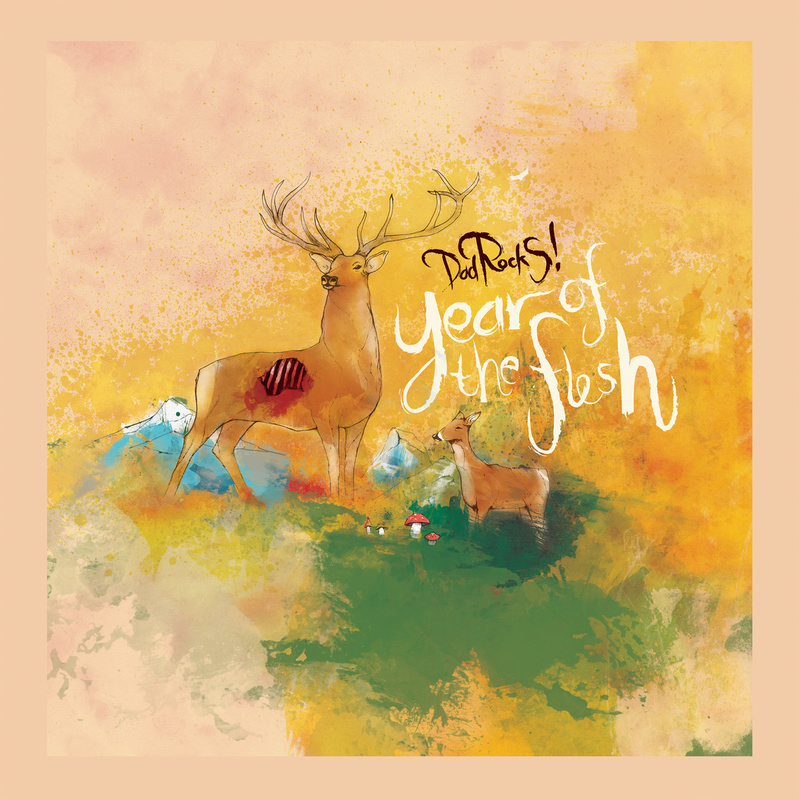 Let’s talk about Year of the flesh instead and how it starts with a gorgeous orchestral piece called ‘BMI’, then short story that is ‘Peers’, which follows the journey of an mp3 song, name checking Pirate Bay and Soundcloud. Then the song (the song referred in the ‘Peers’, not ‘Peers’ itself) tries to find a place in the sea of music we have at our disposal. It’s akin to Milky, the forlorn tragic box from Blur‘s ‘Coffee and TV’, but modernised, compressed and quantised for our ears. This is where you know Year of the flesh is going to be another warm Dad Rocks! album that presents sad songs in a very joyful package. And joyful it is in music while being sorrowful in lyrical form. ‘Daughter track’ talks about cancer and death and before you remember a dearly departed family member (or several), the track weaves a strange figure and then spins you in a pandemonium of sounds. Trumpets, violins and a distorted guitar crumble all together, as if the penny had finally dropped and the realisation of losing someone actually hits you. This is one of two masterful moments in this album. The other one comes in the peppy clap-a-long of ‘In the Seine’, which abandons its folky atmosphere for a crescendo that wraps itself into your soul. There’s always much joy getting into the engrossing lyrics of Dad Rocks!, no matter how harsh the subject. ‘Cyber bullies’ tells a story too common right now (sadly). ‘Managed’ feels a little too personal and this time around, the music is somber. It’s a pretty cold moment in the album, but sometimes you just can’t put on a happy facade over the now protruding frown. Look, this album has been spinning (virtually) in my head for a while and it’s hard to do it justice because although there are several ideas being dealt with, they never jumble together in a fashion that makes them unintelligible. This review, however, does meander too much, so let’s wrap it up: Year of the Flesh is a superior, stronger release than Mount Modern (and I loved Mount Modern) and honestly any negative marks are actually nitpicks, not constructive criticism. Dad Rocks! Tumblr. Bandcamp. Myspace. Last.fm. Facebook. Soundcloud. Posted in reviewsTagged Album of 2014, Dad Rocks!, Year of the FleshBookmark the permalink.